The White House’s commitment to spreading chaos across the world, bringing people of various religions and beliefs misery and suffering is hardly a secret to anyone at this point. After Afghanistan and Iraq, the latest instances of this American obsession manifested themselves in Libya and Syria. This tactic was readily adopted by the administration of US President Donald Trump even though it hasn’t yet spent a full year in office. Yet, we see more calamities looming over horizon, with dangerous games being played by Washington simultaneously against Iran and North Korea. The recent statement regarding the status of Jerusalem made by Trump regarding the status of Jerusalem falls in this familiar pattern, as the US thus demanded other states follow its lead. In such a fashion Trump has not just formally announced his imperial aspirations, or claimed the right to function as global arbiter, but has also buried any hope of negotiations between Arabs and Israelis, even though Washington assumed the role of guarantor of a peace accord between these two parties. By making a statement that looks irresponsible for any sensible observer, Trump has not just violated all of the UN documents signed so far by the United States, he also chose to ignore the plan of Palestine’s partition adopted in 1947, after the termination of the British Mandate. This plan stipulated the creation of a Jewish and an Arab state within the former border of Palestine, while granting Jerusalem an international status as the holy city of the three great monotheistic religions – Judaism, Christianity and Islam. By unilaterally altering the status of Jerusalem Trump has not just showed the true face of “American diplomacy” to the whole world, but has deprived America of an ability to play any constructive role toward resolving the Arab-Israeli conflict or any other Middle East ern conflict for that matter. After all, until now, as a guarantor of Israel’s existence since 1948, the United States has always sought to maintain a balanced position, which allowed America to remain an “honest broker”. As the French Figaro recalls, in November 1956 it was Washington that urged London and Paris, the allies of Israel, to put an end to the Suez war against Gamal Abdel Nasser. In October 1973, Kissinger persuaded the Israelis to loosen up pressure on the surrounded Egyptian Third Army. In October 1991, President George W. Bush initiated the Madrid Peace Conference by inviting the Palestinian delegation to talks, in spite of fierce opposition by Tel-Aviv. Today in the world, according to various sources, there are about 1.77 billion adherents of Islam, constituting 23% of the world’s population. The reaction of the inhabitants of 28 Muslim countries (including the fourth most populous country, Indonesia, and nuclear-armed Pakistan) to the Trump solution in Jerusalem has caused a predictable effect – with aggressive statements coming from all across the globe. Even America’s European allies announced their disagreement. The High Representative of the European Union for Foreign Affairs and Security Policy, Federica Mogerini, stated that Trump’s move has brought the Middle Eastern peace process back to the dark ages. The refusal to support Trump’s position was announced by German Chancellor Angela Merkel, French President Emmanuel Macron, and the head of Washington’s most trusted satellite state – British Prime Minister Teresa May. This universal condemnation was supported by the president of Turkey, a now-formal-ally of the United States and a NATO member, as its leader Recep Tayyip Erdogan described Trump as a person reckless enough to stir up the whole Middle East. The former head of Israeli secret services Yakov Kedmi has recently told the media that Washington has dropped yet another bomb on the Middle East without even giving a second thought to the possible consequences of its actions. Kedmi believes that it’s an example of typical American behavior, associated with ruining even the simplest matters. The Middle East undergoes radical change these days, as tactical alliances are being made and then collapse rapidly, with yesterday’s enemies becoming today’s allies. The development of events and the changes that the whole world and the Arab world in particular are observing seems extremely dangerous for the Arab World. The reason for this is the growing colonial aspirations of the United States. Washington is not just amassing troops and invading states, it’s heavily engaged in hybrid warfare as well. It has consistently relied on the divide and conquer strategy in its dealings with the Arab World, its peoples and the peoples of other Muslim-majority nations. It’s been noted that America has proven itself capable of provoking malice and disgust, of sowing the seeds of hatred and dispute in every Arab state, affecting society at every level: family, tribe, religious group, and political party. In particular, best exemplified by the so-called “Arab Spring.” As all plans and conspiracies against the governments of Tunisia, Libya, Egypt, Yemen, Syria, and Iraq led back to Washington and Israel. Against this backdrop, one cannot help but feel disgust over the recent actions of Trump and his representatives, in particular the sitting US ambassador to the UN, Nikki Haley who would send letters of intimidation to representatives of more than 180 countries in a bid to prevent them from voting in the UN Security Council on a resolution condemning the recent decision of Washington to recognize Jerusalem as the capital of Israel. That’s a vivid example of the so-called American-style of democracy at its best along with Washington’s willingness to put all sorts of pressure on those courageous enough to disobey America’s dictates. The world is becoming increasingly impatient with Washington, a development long overdue decades ago. 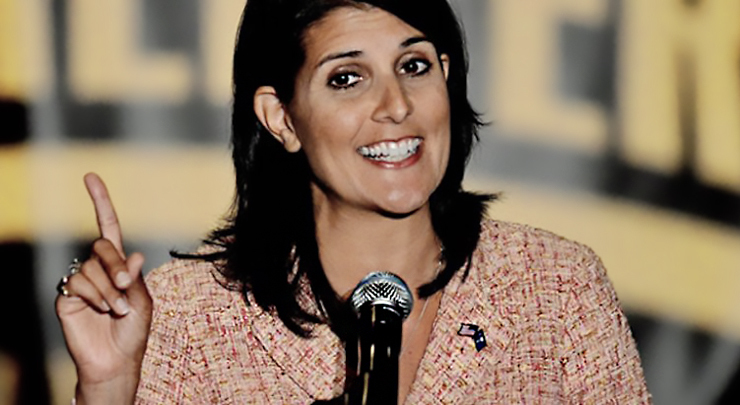 Nikki Haley’s attempts to use her position in a reckless attempt to bully UN member states in clear violation of the UN Charter, pushes this patience toward its breaking point.